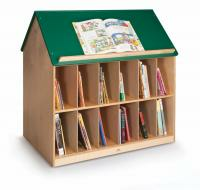 This Book House with Green Roof is accessible from two sides with 12 book storage openings on either side. The green roof is cleated so titles are easy to browse. This unit is perfect for a book island in a library. There are lockable casters that enable the user to reposition the unit and then lock the unit in place. 25" x 41" x 41", 118 pounds. Truck Shipment. GreenGuard certified. Made in the USA. Dimensions: 28in. × 40in. × 42in.